57 Why Should The Fire Die? 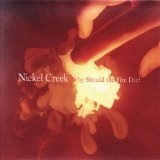 Nickel Creek is an American acoustic music trio. Although the group's music has roots from bluegrass, the trio describe themselves as "progressive acoustic". Nickel Creek consisted of three permanent members: Chris Thile (mandolin), Sara Watkins (fiddle) and her brother Sean Watkins (guitar). The trio have always recorded and toured with a bass player, but no bass player has ever been an official member of the band. Chris's father Scott Thile played bass with the group until 2000, followed by Byron House and Derek Jones. Mark Schatz has played bass regularly with the group since 2003. In interviews, the band have stressed that they are not a bluegrass band but a band that "incorporates bluegrass into [their] music". 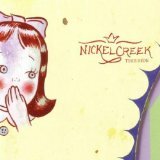 Nickel Creek has covered songs by Weezer, Radiohead, Pavement, Coldplay, Elliott Smith, Bob Dylan, The White Stripes, the Jackson Five, The Beatles, Beck, and Britney Spears. Nickel Creek formed at That Pizza Place in Carlsbad, California in 1989 with Scott Thile, Chris's father, playing string bass. The two families - the Watkinses and the Thiles - met after Sean Watkins and Chris Thile had mandolin lessons with the same teacher, John Moore. Sara Watkins studied with Moore's bandmate, Dennis Caplinger. At the start of Nickel Creek's history, Chris Thile played guitar and Sean Watkins played mandolin after deciding to switch. The oldest of the Watkins children, Sean was only twelve years old at the time.